It's time to stop relying on turn-by-turn directions. Cycling in a city can be stressful, especially if you're headed somewhere that you've never been to before. Most people ride with a specialized cycle computer, or with a smartphone strapped to their handlebars. While useful, both devices can be a distraction on busy, dangerous roads. Instructive turn-by-turn directions also do little to improve your street-level knowledge -- the screen becomes a crutch, rather than a tool to help you learn about the various roads, bridges and tunnels around you. Enter BeeLine, a new type of cycling computer. It works more like a compass than a traditional GPS device, with just an arrow to indicate the direction of your final destination. There are no turn-by-turn instructions -- just a general indication of where you need to go. It pairs with your smartphone over Bluetooth and presents information with a coin-sized e-paper display. Before setting off, you'll set your objective in the app and any places you want to hit along the way. BeeLine will then spring into action, tracking your position with its built-in magnetometer, accelerometer and gyroscope, as well as the GPS on your smartphone. The arrow gives you a sense of where to go, but it's up to your eyes and ears to figure out the exact route. On a chilly Tuesday morning, I pedalled through central London to find the BeeLine team at four mystery locations. Needless to say, it was trickier than I anticipated. The computer would often suggest a hard right, for instance, but I was stuck on a road without a right turn for several miles (or rather, it felt like miles). I had no choice but to barrel down the street and wait for an opportunity to course-correct. Sometimes I would take a seemingly correct turn, only to find the road was a dead-end. Occasionally I felt frustrated, like I was wasting my time and the people around me who clearly knew where they were going. But there were clear benefits too. I soon stopped staring at the screen and examined the world around me. Cycling in London is hard, especially when you're surrounded by aggressive or just plain inconsiderate drivers. Using BeeLine meant that I could keep my eyes on the road and avoid nasty collisions. I also loved the glanceable nature of the display. A quick look down and I knew immediately if I was headed in the wrong direction. No looking at street names or wondering why the blue dot in Google Maps had stopped moving. Just a simple arrow and the distance left to travel. 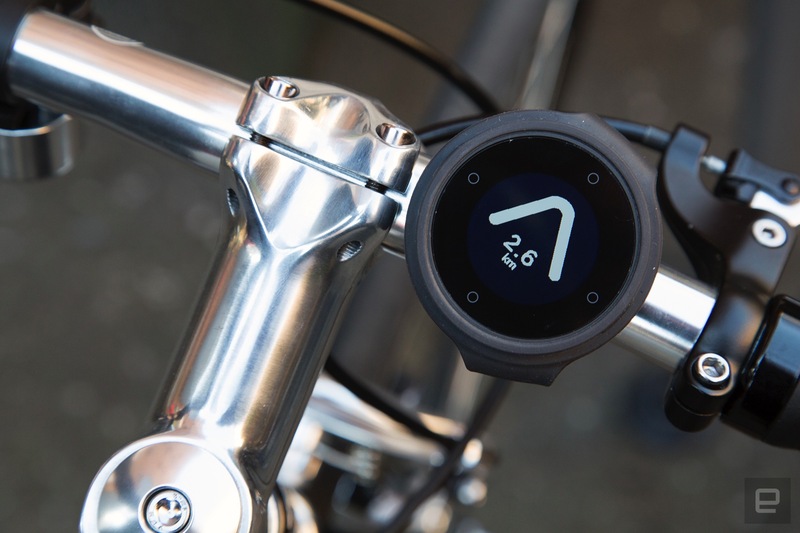 The BeeLine computer comes with a silicone strap that wraps around your bike's handlebars or stem. The device is water resistant while it's inside the protective case, but you'll need to take it out to charge the included 350mAh battery. That shouldn't happen too often, however, because the team says a single charge will last you roughly four weeks -- your own mileage will vary, however, depending on how often and far you ride. Cycling this way isn't for everyone. If you're in a rush, or struggling with a city's road layout, you'll probably want specific instructions. No fuss, no time-wasting, just detailed directions. And that's okay, because BeeLine is aimed at a different crowd. The cyclist who has more time on their hands, or likes to ride for fun at the weekend. It might take you longer, but the process will make you a more educated rider. And once you know a place inside out, you might not need BeeLine at all. Then you'll be faster than the people stopping at every junction to check their route on Google Maps. BeeLine started as a Kickstarter project in 2015. The London-based team is now shipping its first units to backers and taking regular orders online. It comes in grey, red and blue, and will set you back £99 (roughly $119).